An uncommon complication intended for mountaineers at an affordable price. 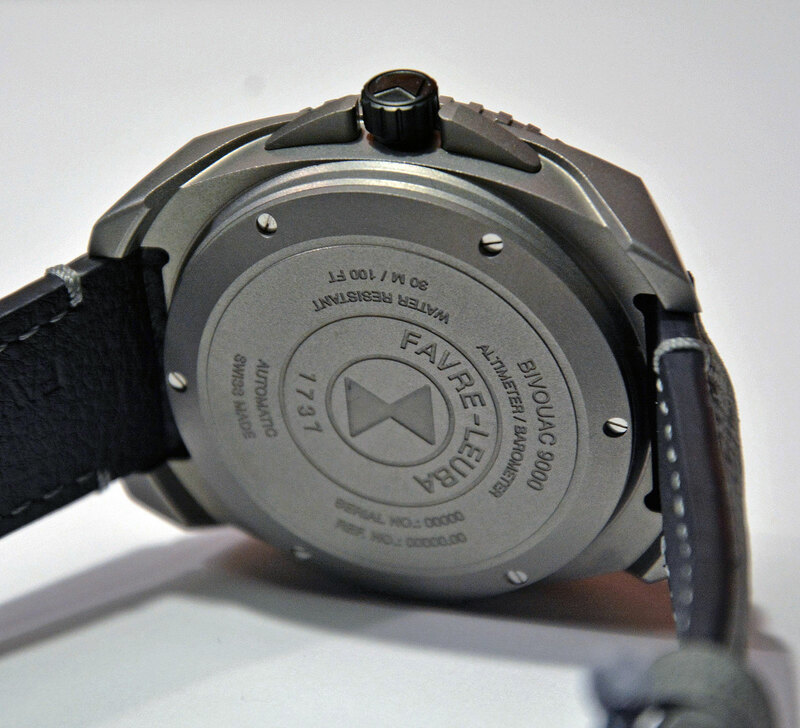 Once a prominent name in Swiss watchmaking, Favre-Leuba was rebooted last year. After a hiatus of several years, the brand put on its first exhibition at Baselworld in March 2017. Amongst the new launches was the Bivouac 9000, a technically interesting yet affordable watch for mountaineers that features a built-in altimeter. The Bivouac 9000 is one of the first watches from the relaunched brand, which is still in the early days of its resurrected. 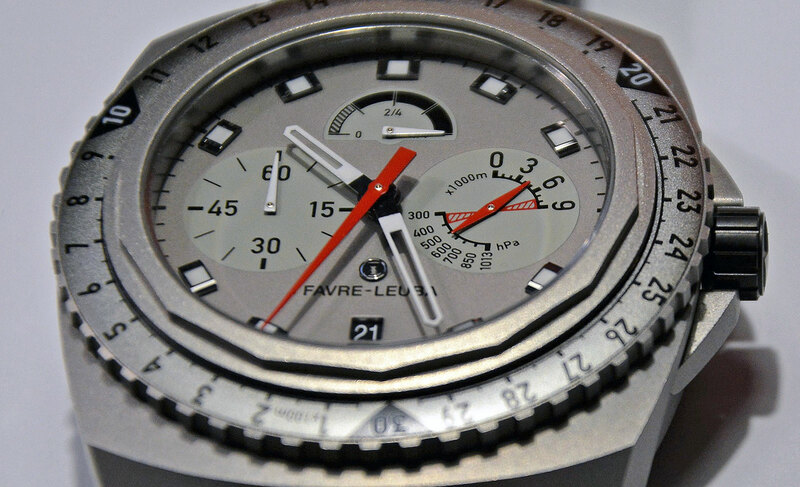 Though Favre-Leuba produced more than half a million watches annually in its heyday before the Quartz Crisis, it was dormant for several years, after repeated changes in ownership. Things only started moving again when new management was installed in 2015 by Titan, the watchmaking subsidiary of Indian conglomerate Tata Group that bought the Swiss brand in 2011. The Bivouac 9000 stands out from the other watches in Favre-Leuba’s 2017 line-up, not only for its bold appearance – the watch is 48mm in diameter and 18.7mm high – but for the uncommon complication inside. The Bivouac 9000 is actually a throwback to the original Bivouac of 1962, which was the world’s first wristwatch with an aneroid altimeter, an idea that has been revisited and improved for the Bivouac 9000. Designed for explorers and alpinists, the Bivouac 9000 is equipped with a mechanism that’s capable of measuring altitudes of up to 9000m above sea level. The bezel of the Bivouac 9000 is engraved markings in 50m increments on a scale that goes up to 3000m. A large red hand, which is reminiscent of a central seconds, moves clockwise as air pressure decreases with increasing altitude. The movement of the red hand indicates whether the wearer is climbing or descending, with the bezel serving to indicate the height above sea level. As the red hand moves clockwise around the dial, a small hand on the sub-dial at three o’clock moves alongside. The sub-dial at three o’clock is graduated from 0m to 9000m, in sub-divisions of 3000m. Once the central red hand completes once rotation around the dial, the smaller hand on the sub-dial will point to 3000m. A second rotation of the central hand will bring the sub-dial pointer to 6000m, and so on. 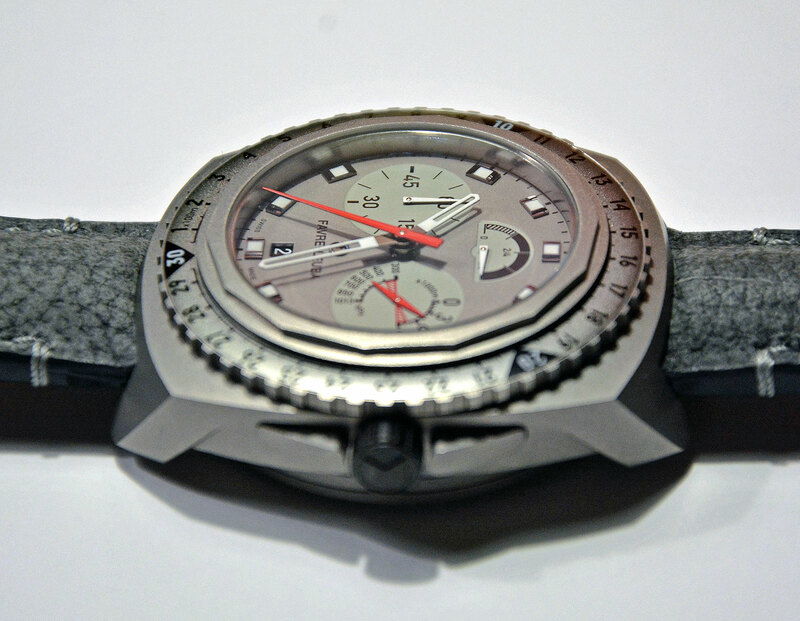 Additionally, the Bivouac 9000 indicates air pressure on the same sub-dial at three o’clock, shown in hPa. The mechanical altimeter works via metal capsule that expands or contracts depending on the surrounding air pressure. This mechanism is linked to the red central hand that indicates altitude. Because the capsule requires exposure to the atmosphere to measure pressure, there is an air intake on the side of the case at nine o’clock. But the capsule is sealed with a hydrophobic membrane that allows air but not moisture or dust to penetrate, giving the watch a water resistance of 30m. The movement is hand-wound with a power reserve of 60 hours that’s displayed on the sub-dial at 12 o’clock. Additionally the aperture at six o’clock shows the date. The hands as well as the indexes are luminous for an enhanced legibility. 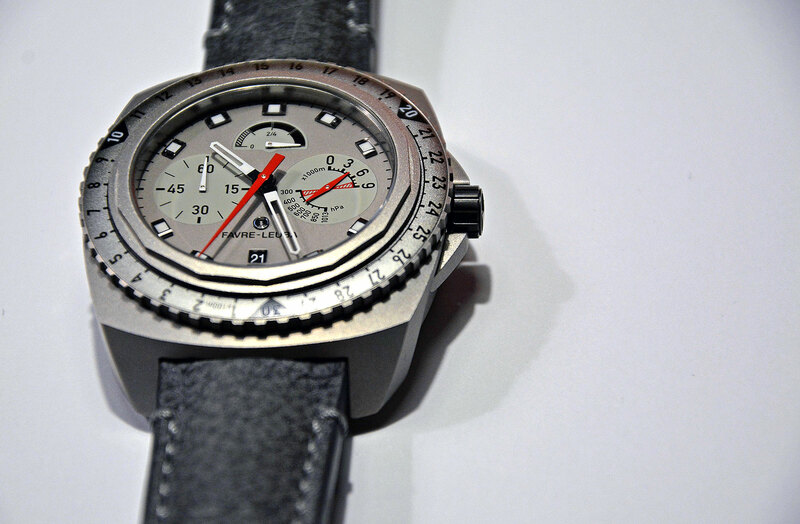 The Bivouac 9000 has a titanium case, making the watch surprisingly light considering its rather large dimensions. Note that the crown guards as well as the crown shown on the prototype in the photos are not on the final production model. The production version will be as depicted in the stock image below. While the design of the watch might be requiring getting used to, the watch offers an interesting and uncommon complication at an affordable price. 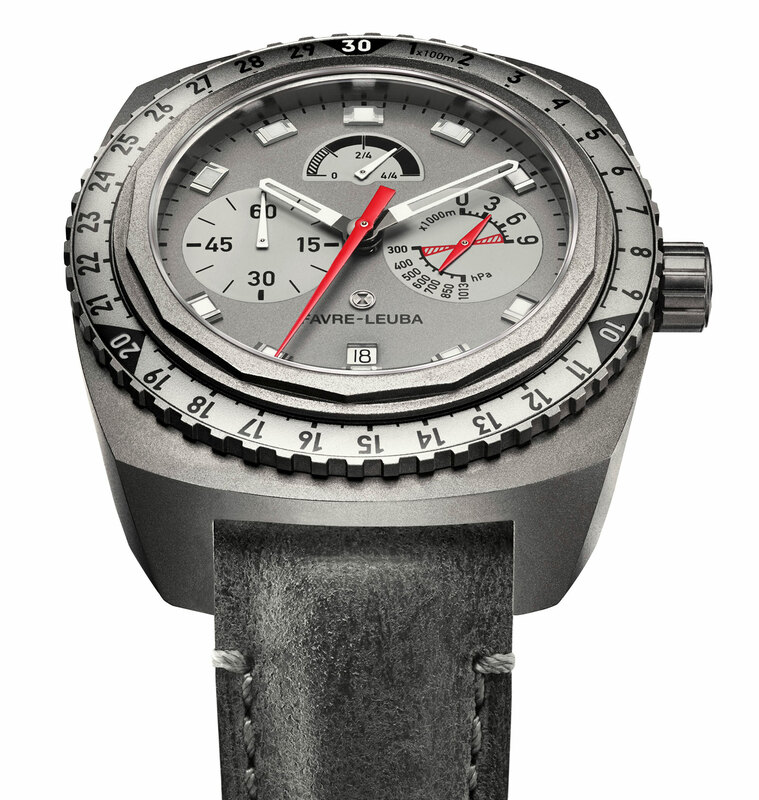 The Favre-Leuba Bivouac 9000 will only be available in titanium with a “stone grey” dial, fitted to a grey leather strap. The retail price will be SFr7500, or about US$7600.